What kind of energy is stored energy? 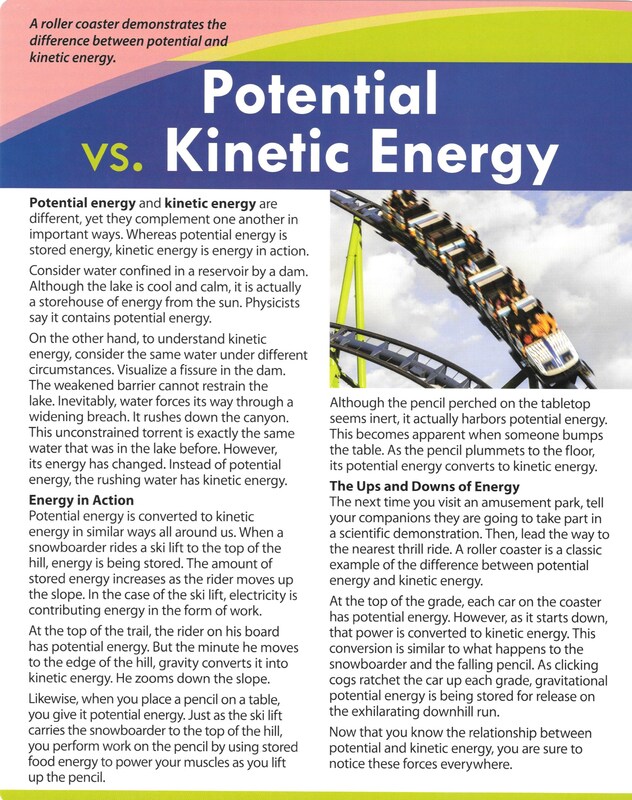 Which detail does not support the idea that there are different kinds of energy? Releasing water from a dam converts energy. Gravity converts it into kinetic energy. Riding a ski lift uphill stores energy. Roller coasters are thrill rides. What does inert mean in the text? Which word best fits the following description... "Most destructive"
Which word best fits the following description... "Most technical"
Which word best fits the following description... "Slowest"
Which word best fits the following description... "Most contained"
Using details from the article, explain how potential and kinetic energy relate to your favorite sport or activity. Include an introductory sentence, concrete details and examples, and a concluding sentence that sums up your points (RACES format).